Brentwood is located in Suffolk County. If you live in the Brentwood area, Mark S. Eghrari & Associates, PLLC can provide you with help and support with a wide variety of elder law issues. There are many different services elder law attorneys can provide to you, including services that you may not expect. For example, attorneys at Mark S. Eghrari & Associates, PLLC can help with legacy planning and end of life issues, but can also help with asset protection, making plans to get Medicaid to pay for nursing home care, probate proceedings, and more. To find out about all of the different services that Mark S. Eghrari & Associates, PLLC can offer you, you should give us a call. You can also read on to learn more about what elder law attorneys do and to find out about some resources that can give you insight into why it is so essential to talk with an elder law attorney. Brentwood seniors may come to need extra help and support during their later years, especially if they wish to remain independent for as long as possible. Seniors can maintain community connections and get the help and support they require by taking advantage of senior services available in the Brentwood area. Seniors can visit the website of the Suffolk County Office for the Aging. The information you can find on this website includes details about services such as adult daycare; elder abuse concerns; benefits counseling; home energy assistance programs; caregiver support programs; senior employment; health insurance counseling; nutritional programs; and programs offering legal assistance to the elderly in Brentwood. While community-based services can be very helpful to seniors during the aging process, there may come a time when older Bentwood residents require more help and support than can be made available through free or low-cost community-based programs. If this occurs, Mark S. Eghrari & Associates PLLC can help seniors to explore options for getting nursing care or home care covered. One of the most important things that elder law attorneys can do for Brentwood seniors is to help them qualify for Medicaid in case they need long-term care or in case they need to move into a nursing home. Medicare does not provide payment for nursing home care except in limited circumstances where you need skilled nursing care. Medicaid, on the other hand, will pay for care but only if you can qualify. Mark S. Eghrari & Associates PLLC will help you to ensure that you’re able to get qualified for Medicaid coverage. Medicare’s website detailing the rules for when Medicare provides coverage for nursing home care. The sooner you begin making a Medicaid plan, the more of your money and property you can protect. Mark S. Eghrari & Associates PLLC will assist in determining if you need a plan and will help you to ensure your money and property will be safe if you must move into a nursing home. Mark S. Eghrari & Associates PLLC provides assistance to clients in taking important steps to prepare for incapacity or to prepare for the transfer of assets after they pass. These services provided by Brentwood elder law attorneys can ensure your loved ones do not need to go to probate court to get a guardian or a conservator named in the event of incapacity. Our attorneys can also help you to explore ways to help your family avoid the probate process and inherit assets more quickly, cost-effectively and privately using different means to transfer wealth. This could include trust administration or joint ownership, among other techniques. Sometimes, however, probate proceedings are necessary to have a guardian named or to be able to pass on money and property after your loved one has died. If you must go to probate court in Brentwood, you can find helpful resources on the Suffolk County Court website. 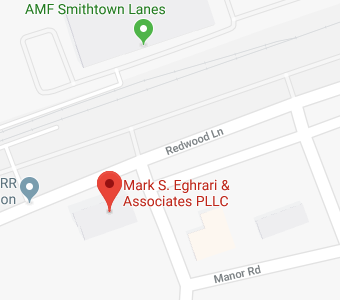 Mark S. Eghrari & Associates PLLC will represent you during probate proceedings, whether you want to have a guardian named for an incapacitated loved one, or you have been named as executor of an estate or stand to inherit after a death. If you are concerned your estate will owe a substantial amount of money after your death because you will be faced with a big estate tax bill, you should reach out to our legal team as soon as possible to explore ways to reduce your tax bill. Brentwood elder law attorneys at Frank & Kraft will provide you with personalized assistance and advice as you make plans for your legacy, prepare for when you may need nursing home care, and plan ahead for a more secure future. We can represent you at all phases of your life and will work to ensure that you and your family are protected and prepared for whatever the future holds. To find out more about how Mark S. Eghrari & Associates, PLLC can help you, join us for a free seminar. You can also give us a call at (631) 265-0599 or contact us online to get personalized assistance with all of the key services that elder law attorneys can provide. Call today to learn more.